Spice up your Father's Day barbecue with a Mexican flare. 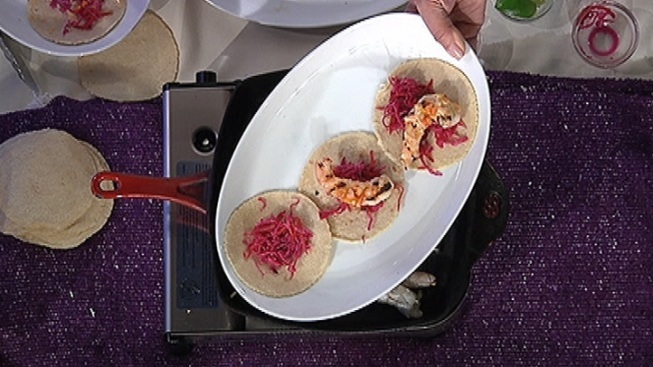 Chef Steven Lukis from Rosa Mexicano show us how to make San Felipe shrimp tacos. Mix all ingredients in a bowl. Allow to sit for at least 1 hour before serving. Mix all ingredients together in a bowl and season to taste. Allow to sit for at least 30 minutes unitl ready to use. Mix together the crème fraiche and the chipotle puree. Reserve cold until ready to use. Soak the skewers in water for a while so they won’t burn when grilled. Skewer the shrimp through the head to the tail so they stay straight when cooking. Put the shrimp in the marinade for about 10 minutes. Once marinated, season with salt and grill for about 2‐3 minutes on the first side and then about two minutes on the second side. Heat the tortillas in a dry sauté pan until they soften up. Lay them out on plates or on a platter if serving family style. In a bowl, toss the watercress leaves with the radish julienne an a little lime juice and salt. Spread the salad over the tortillas. Take 1 tablespoon of the cabbage and put on each tortilla. Top the cabbage with the shrimp. Top each shrimp with about 1 tablespoon of the salsa. Top with the chipotle crema, just a little drizzle.